Novotel Melbourne on Collins welcomes you to experience contemporary style and 4.5 star comfort in the heart of Melbourne. 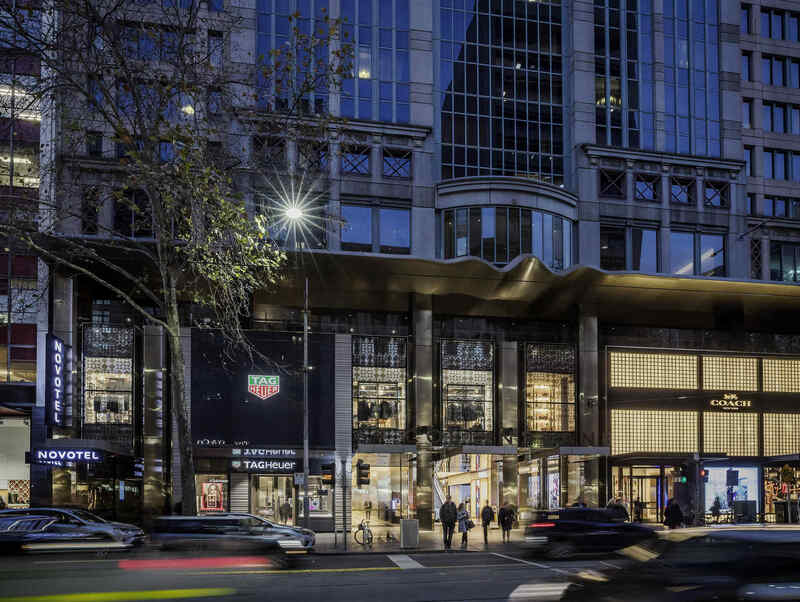 Located on fashionable Collins Street and directly above the upscale St Collins Lane, Melbourne's most unique shopping destinations . This desirable location near Rod Laver Arena, the MCG, Federation Square, the Princess and Regent Theatres and more, at the doorstep to all this cosmopolitan capital has to offer. As one of Australia's most fascinating cities to visit, Melbourne is simply packed with exciting things to see, do, listen to and taste - and Novotel Melbourne on Collins is the ideal base from which to discover it all! Novotel Melbourne on Collins is situated right in the heart of Melbourne. Feel immersed in all that this cosmpolitan city has to offer with the MCG, Rod Laver Arena, Federation Square, Bourke Street Mall, the Theatres and fabulous restaurants and bars! Modern and beautifully presented, the conference facilities at Novotel Melbourne on Collins provide the ideal setting for meetings, conferences and events in Melbourne. Featuring nine contemporary function rooms, this impressive Melbourne conference centre can accommodate eight to 400 delegates in a range of layout configurations, including theatre, banquet, classroom and boardroom styles. The pillarless Australia Ballroom is the hotel's largest event space, offering plenty of natural light and unimpededviews for conferences, gala dinners and trade shows. Guests organising an event at the hotel can benefit from a range of state-of-the-art conferencing equipment, as well as the support of the hotel's dedicated events team and onsite audio visual company. Whether travelling on business or visiting in leisure, guest rooms at Novotel Melbourne on Collins provide everything needed for a restful night's sleep. Offering striking city views, guest rooms at this stylish Melbourne hotel are beautifully appointed and tastefully decorated. Guests can choose from a variety of accommodation styles, with Standard, Executive, Suite and Family options available. Each room features a work desk, an LCD TV, cable and WiFi internet access, a minibar and a modern ensuite. A Spacious room with a King or 2 Double beds with feather duvet, pillow menu for a perfect night's sleep, ensuite bathroom, 40" LCD TV, complimentary in room WiFi, large desk and views over the Atrium, or City. A Spacious room with a Queen or 2 King Single beds with feather duvet, pillow menu for a perfect night's sleep, ensuite bathroom, 40" LCD TV, complimentary in room WiFi, large desk and views over the Atrium, or City. Large, well designed, the Suite includes an open plan room with lounge area and ensuite. Our Junior Suites and Deluxe Spa King suites offer LCD TV, WiFi, Nespresso Coffee machine, a double sofa bed and views of the beautiful St Collins Lane Atrium. Lane Restaurant is located on Level 3 and overlooks iconic Collins Street. This modern style restaurant features extensive breakfast buffet, café lunch and a la carte dinner menu, designed to reflect Melbourne's vibrant food culture. For the perfect espresso, signature cocktails, a light meals and share style menu, Lane Bar is an ideal place for meeting friends or colleagues. Or catch up on work at the same time, with 30 minutes free WIFI for all guests. The staff was the BEST. So very helpful. The room was really nice and well kept. This was our first experience in Australia and we stayed in Sydney, Adelaide, and Melbourne. Novotel was our favorite. Great central location to get out and see the sites! Thank you!!! Our experience was lovely. Though it was difficult have two double beds with our two children. We realized we should have had one bigger bed for my husband and I. We took our children for a swim on the pool and it was too cold for them to swim in and this was one of the reasons why we chose your hotel because it had an indoor pool. So this was a little disappointing. The breakfast was beautiful and well catered for. So convenient, to all parts of the CBD could walk everywhere we needed to. Really enjoyed most of our star at your hotel. Check in was seamless and the staff friendly. We upgraded to a junior suite which was lovely. The only downside to our stay was whilst eating in your restaurant. After being seated and ordering some food and drinks, we asked one of the staff, Nigel if we could order another drink and were rudely told we needed to get our own drink at the bar. No sure why we needed to do this as all other tables around us had table service. Very disappointing. I was very disappointed that the only view outside the room was a scaffolding type arrangement which made the room very dark & dismal as there was no natural light at all (I do understand that there is not much you can do about that though!). Upon entering the room I felt the room had a very off putting stale type odour which wasn't pleasant at all. The ceiling lights were VERY insufficient - the room was way too dark. Definitely need much brighter globes and more ceiling lighting. The room had 2 lamps which helped but the lack of good lighting was definitely an issue for us. Power point at the side of the bed was difficult to access to charge phone - would be good to have slightly further away than it was to make it easier to access. The carpets in the lifts looked very dirty & I think that it could do with a good steam clean. Made me think that perhaps the carpet in the room hadn't been steam cleaned for a while & perhaps that was the cause of the off putting odour. On a positive note - the staff were very helpful and pleasant which was great. We were thrilled with a couple of complimentary drinks at the bar and the macaroons & strawberries as a gift for our stay. I had said upon booking that it was a special treat as it was our anniversary and also my Husband's birthday. so a really lovely touch - thank you! We had dinner at the bar and the food was lovely. Thank you for discounting the valet parking which would have - at the original price - made the whole stay too costly and not possible. Buffet breakfast was something we were really looking forward to but unfortunately most of the hot food was warm at best and we both thought that it would be better to put out smaller amounts and replenish more frequently. The tomato, sausages & bacon were very under cooked. The variety was great and the omelettes were lovely. The staff were very helpful catering to our needs. Nothing seemed to be a problem. Everything worked as expected and ew enjoyed the evening. That also extended to the restaurant when’re we enjoyed a lovely meal. Staff were great, room was great and the location suited our needs perfectly. I will say that the resturant didn't look all that inviting, even for a quick breakfast. The bar area looked great but then the eating area did not make me want to stay for a meal. I spend little time in the hotel as I was on business but found it clean with good service. The breakfast was lovely!! I arrived late, and was met with a smile and shared a laugh. Set up the stay nicely. The room this time on the 7th floor whilst spacious was much older, noisier and hotter. Hard to cool down and a long way from the lift, although very close to the gym. Amenities were not as normal standard for my regular frequent stays here. We were greeted at Valet and our car was taken for parking . I find the delays on your lifts to reception a bit long, especially as the elevators service only 3 levels. Your Foyer is always hectic and chaotic, especially with a 4pm arrival on a Friday. A loud busy bar with drinkers interspersed by stranded travellers and luggage. Your reception was unusually efficient on this occasion. Your check - in email had been diverted to junk mail.. The room was an oasis of calm. The restaurant service was good and the meals satisfying. At breakfast, as always, chaos reigns. There was a shortage of glasses, teaspoons and scrambled eggs. I used the express check out. The experience was enjoyable and relaxing. The hotel is central to all areas of inner city Melbourne and nothing was too much trouble for the staff to accommodate us. Check in was quick staff very helpful nothing was too much trouble Breakfast staff accommodating with dietery issues concierge staff very helpful. Great Hotel well located in CBD friendly staff, only issue is with the valet parking we returned to the hotel at 7pm a coach and a single car where parked directly in front of the entrance requiring me to stop about 25 meters up from the door the staff said they could not take the car as it was not in front of the door I was required to revers back when they had the coach reverse a few meters a dangerous practice. Very welcoming, all facets seem to work seamlessly.